In South Australia, you’ve got three peninsulas. The Fleurieu, a beautiful eastern chunk; the Yorke, the Italy-shaped boot in the middle; and the Eyre, which we could fairly refer to as the Wild West. The Eyre is the furthest from Adelaide, the most untouched. Skyscrapers feel a long, long way away. The people live relaxed lifestyles, the fish throw themselves at the hook, and the waters offer up a bounty of activities from sightseeing to surfing. The further west you go, the wilder it gets. 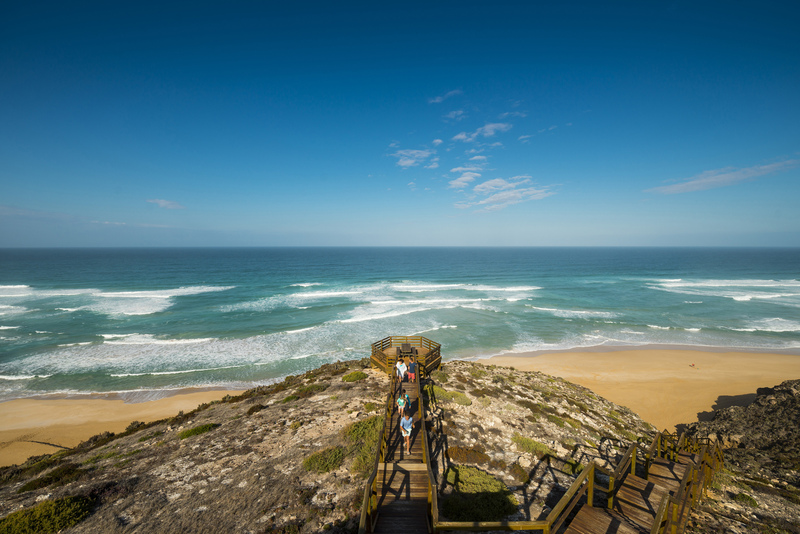 In this article, we’ll take you on a virtual jaunt along the coast, so you can build your own itinerary, hit the road and generate an unforgettable wealth of salt-stained memories. Picture a brown kelpie, off of his lead, roaming along a small quay while his owner leans on the rails and chats with a mate. That’s an image from Coffin Bay that’s stuck with me, one which basically sums up the laid-back energy of the place. While you’re in town, taste the oysters, washed down with white wine; or, walk the Oyster Walk with its interpretative signage (about remnant coastal vegetation and the region’s history), during which you’ll see the bay and its oyster racks. If you have kids in tow, there are plenty of opportunities for swimming, sand castles, beachcombing and feeding local pelicans. You can take advantage of the domestication before you head further west, to go on oyster tours, fishing charters or paddling trips in hired kayaks. While you’re in the region, you can also duck into Port Lincoln and head out on a seal dive with Adventure Bay Charters. I’m told this is great fun, catering to a range of abilities, with the seals curious and keen to say hello! However, some would say the real magic starts when you shun civilisation, heading instead into Coffin Bay National Park. 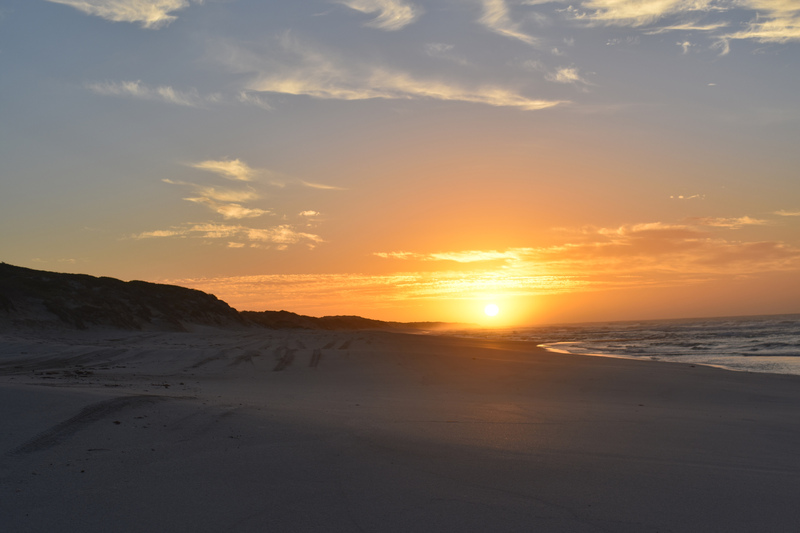 There’s plenty of camper-friendly campsites here, for just $12 a night: Yangie Bay, Big Yangie Bay, Black Springs and Morgan’s Landing. 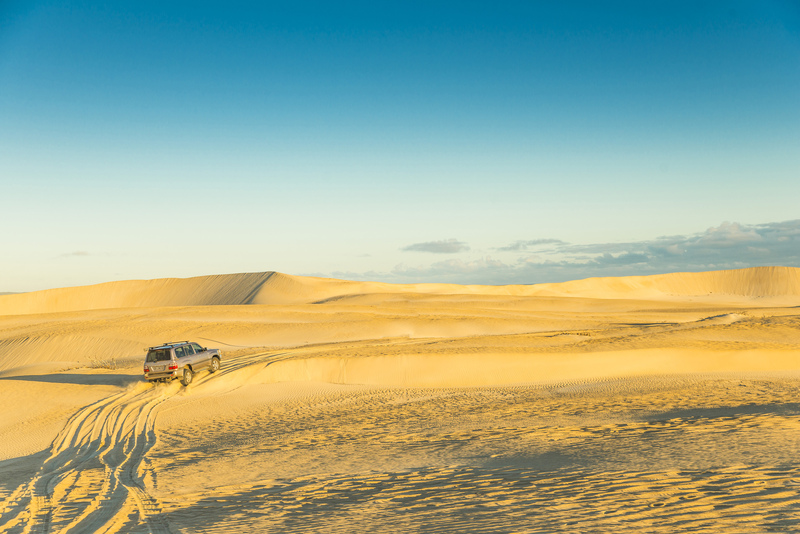 The 4WD track to Gunyah Beach gives you the opportunity to justify your 4WD over a set dune track. On the way to the shore with its stacks of white surf, you can disembark and walk around the massive paradise of undulating sand – staggering in proportion, intricate in pattern, and formed by millennia of onshore winds. Alternatively, take the easier path to nearby Almonta Beach – just keep your eye out for emus and their mottled youngsters, because these adorable, goofy poor decision-makers abound. Once there, don the snorkel and dive in the lagoon formed at low tide for a chance to see the likes of blue groper; or, at high tide simply marvel at Golden Island and the multi-directional waves clashing over the reef nearby. This is but the tip of the iceberg. The roads leading through the flat sheep-grazing territory to Elliston don’t see much rubber. So, if you do pass someone, make sure to raise your finger from the wheel. It’s easy to feel alone out here. So, when we visited a few years ago, it was a relief to have 50 cows for company. 50 cows on the tarmac, that is. Running down the road. We idled behind them, laughing but concerned for their welfare and relieved we’d seen them in ample time. They ran along for three minutes before finally veering off onto the shoulder. Arriving in Elliston, we always head to Elliston Waterloo Bay Tourist Park – a cheap, friendly and clean place to stay. It’s worth noting they are reasonably equipped too; I was able to clean orange cordial from my clothes, using washing powder bought from behind the counter and washing machines on the premises. At night, we love to cook up a storm at the secluded barbecue shelter out the back near the inflatable bouncing pillow, from where you can hear the carried noise of sports teams training on the local oval. From this park, it’s just a short walk to the jetty where there’s good odds of seeing a gigantic stingray; you’re even closer to the town centre, where the relaxation will rub off on you. I had to cast my ballot paper there one year and it was a pleasant weight off my shoulders to see ladies selling cake and not political campaigners forcing leaflets down my gob. I’ve also heard the pharmacist only works on bad surf days. And who can blame him? The surf at Blackfellows is renowned as some of the best countrywide. If you aren’t Mick Fanning, you can appreciate it from the clifftops instead. This will put you near some unusual sculptures along the Anxious Bay Clifftop Drive, including a pair of big thongs. Booming surf and limestone cliffs define the area. This is particularly the case at Locks Well, a beach just over 10kms out. Heading to Locks Well from Elliston in the early morning has left a deep imprint on my memory, of fog over the farmland, hazily defined windmills, and wombats munching grass. The beach comes into view at the end of a three kilometre detour from the main road; a hexagonal wooden platform extends to the edge of the cliff and you feel lordly, looking down on the waves like a drone. Heading down the stairs will make you feel human again – but it’s worth it to cast a few lures or pilchards out for salmon. We’ve snagged big numbers here, including an 81cm beaut. 40km north of Elliston along the Flinders Highway, you’ll take a left turn onto an unsealed road, which winds its way to the cliffs. Opposite the Woolshed Cave, bush camping is on offer – that is, the rough stuff without facilities but with ample space and no need to book; you can also arrange camping at private properties. From your base nearby, you can explore the epic Talia Caves – most notably the aforementioned Woolshed, a huge cavern eroded into the granite by endless years of booming waves, with a walkway providing close access and the option of going inside, to look out at the sky framed by the limestone entrance. There’s also the Tub, an aptly named 20 metre deep crater, somehow formed by the sea and not a meteorite. Where the cliff ends, the beach begins – parallel, but set back from the cliff-line. From near the monument to Sister D. B. Millard on the clifftop, you can stand and look down along the beach, which stretches on for 20km (not that you can see that far, with the undulations, curves and sea spray). The story goes, in 1928 Sister D. B. Millard resigned from her hospital job and headed to Talia beach the next day, where she drowned after a piece of cliff under her broke away. Many times, I have been fishing down on the beach and mistaken the silhouetted monument for a person watching me. The truth is, you are unlikely to see many others here. This beach played host to one of the most successful day’s fishing I’ve ever had. My brother and I pulled up, near the monument’s vantage point. We watched as a group of dolphins cornered a huge school of salmon into the pocket of ocean enclosed by the beach on one side and the cliff on the other. Before the dust had settled behind our car, we had unpacked the rods, bolted down the dunes and started casting lures. Needless to say we caught dozens of salmon. Attempting to replicate our success the next day, we were met with storms, and gave in after a few hours of defying the battering rain and clumps of weed. You can’t hold it against the place; the vagaries of the Eyre are part of its allure. 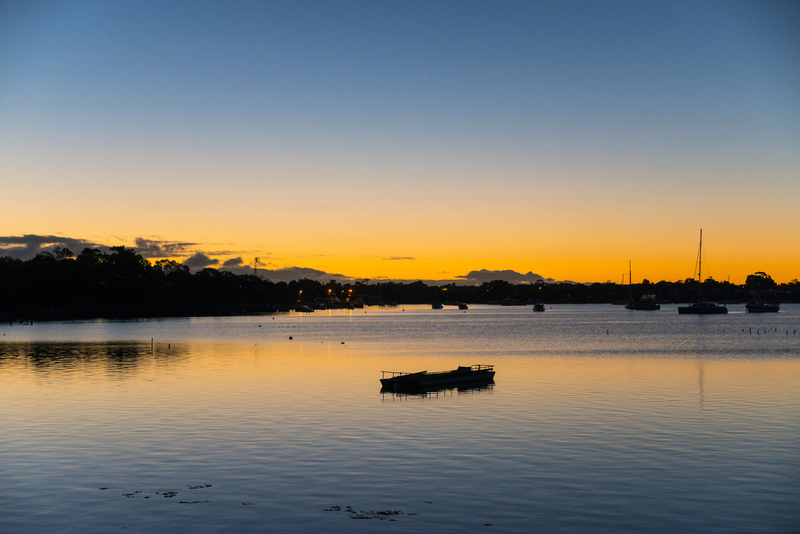 Just short of 90km north-west of Talia is the small seaside town of Streaky Bay. 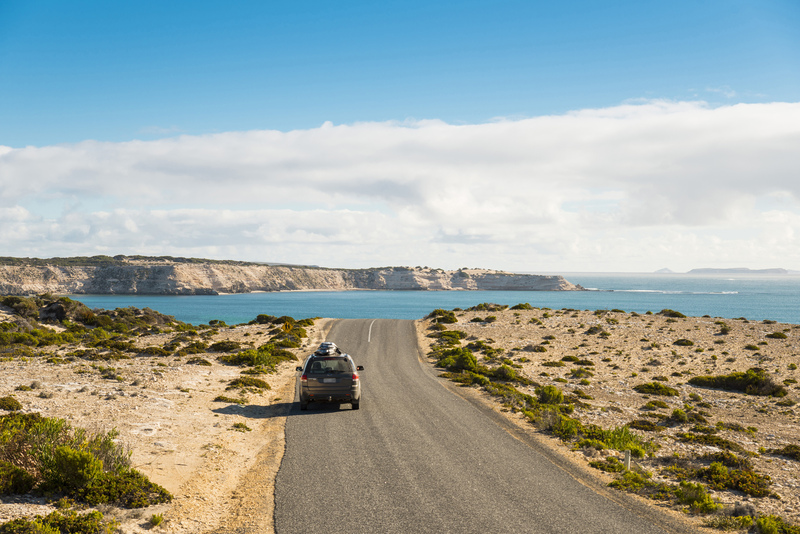 The town is nice in and of itself, with short-term parking available for campers and the Streaky Bay Islands Caravan Park offering sites from between $24 to $45 dollars, depending on the season and your needs. Various museums cater to the curious; these include the National Trust Museum exhibiting indigenous, religious and agricultural artefacts, and the Powerhouse Museum exhibiting over 400 restored engines from various occupations spanning the last century. 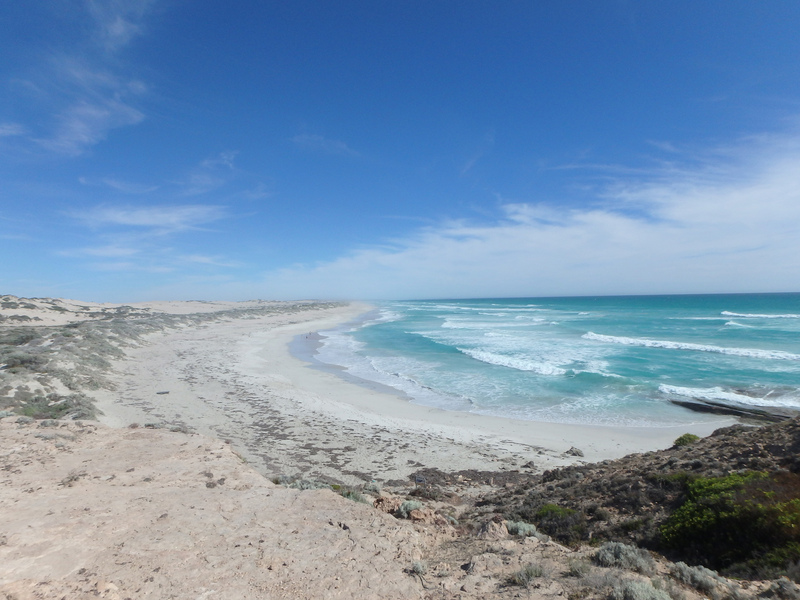 If you are there during New Years, head to Perlubie Beach to watch or participate in the Eyre-famous NYE Sports Day. Locals participate in various competitions including a 1.6km footrace, a swimming competition and a tug of war. 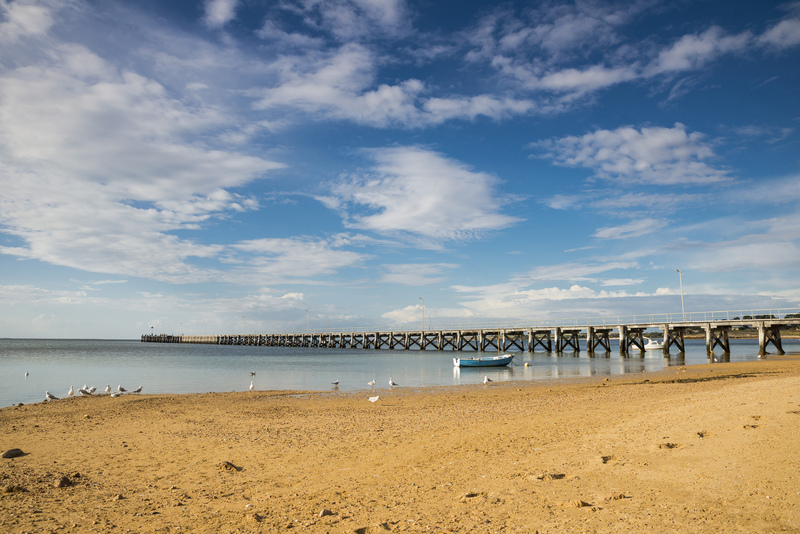 Streaky Bay is well-placed to act as a base camp for coastal drives in the surrounding area. The Point Labatt Drive places takes you to a viewing platform, from where you can look 50 metres down towards a permanent colony of 50-odd sea lions, living alongside New Zealand fur seals. Also check out the Westall Way Loop. Along this track you can camp at the Tractor Beach or Speeds Point camping areas, both semi-secluded sites with easy access to the water, costing just $10 a night. Additionally, the Cape Bauer Loop draws in the photographically-minded, with the brutal limestone ruggedness of the Whistling Rocks and their support act, the Blowholes. Here you’ll hear the howl of onshore gusts through rock formations, summoning all the sorrow of the ocean; and on high tide and rough swell you’re apt to see water jetting up as the waves crash, potentially creating a rainbow effect. It would be rude not to mention Murphy’s Haystacks, two clusters of strange rock formations (technically called inselbergs) jutting out of the otherwise flat wheatfields up to eight metres high. They’re on private property, but for a small donation made at an honesty box, you can roam among these pink-grey granite monoliths and recognise shapes such as a mittened hand or a giant’s tooth, and be taken aback by the colourful lichens growing on their surfaces. As you head further west, past Ceduna and off of the peninsula, the population drops even lower and the landscape turns even wilder. The best cluster in this great beyond may well be Fowlers Bay, Dog Fence and Yalata. After having found our camp (something of a fluke – I advise booking in advance), we walked up the immense dunes that tower over the town; from these heights, we looked down as the setting sun painted the settlement’s old-school one-story buildings and intermingled coastal pines a warm pink. I’m told we were a good chance of seeing a Southern Right Whale from up here, or from the neighbouring coast (there’s even a whale watching cruise in the area). Albeit, no dice this time. In this same vivifying evening light, we drove around some of the region’s back roads, over salt plains and through corrugated red sand. It’s spartan desert country, forewarning of the nearby Nullarbor; you’re apt to discover all sorts of ruins and relics out here, plus you have the opportunity to put your camper’s offroad label to the test. Don’t take five year old Billy Bob to Yalata’s beaches (which require booking through indigenous land management well in advance) or to Dog Fence Beach (named after the 5,000km fence built in the nineteenth century to keep out dingoes). This is unvarnished Australian bush. It’s in the middle of nowhere, completely without facilities or resources. Realistically it’s only for well-equipped anglers prepared to endure discomfort for what they love (mulloway and big sharks), or for those wanting to put their self-sufficiency (and their camper’s) through the wringer. In this zone, after cutting off from the highway and venturing cross-country, you’ll find yourself among the dunes and the shrubs, alone with the ocean. Or perhaps you’ll meet the folkloric legend, Leatherman, a whispering spirit in the sands as much as an actual person; this mythical bloke took off from Port Lincoln in his camper and is said to spend his time living off his catch, listening to the cricket broadcast on his satellite radio, and developing skin like leather through sun exposure. As Leatherman knows too well, the days are long out west and the thunderstorms, when they come, rattle your bones like gambling dice. Earlier this year, in this great beyond, my brother and I quit fishing in 45 degrees and retreated to our camp, seeking shelter, only to find our gazebo destroyed by the wind. We proceeded to hot-potato all of our gear into the ute’s tray and hit the road, fumblingly preparing Gatorade from powder over the bumpy outbound track, muttering and semi-delirious by this point (take this all as an object lesson in under-preparation). What made it worth it was catching a five foot bronze whaler, seeing the stars completely undiluted by light, and the feeling that, woah, this is the real deal.